This weeks assignment was to make five of something. 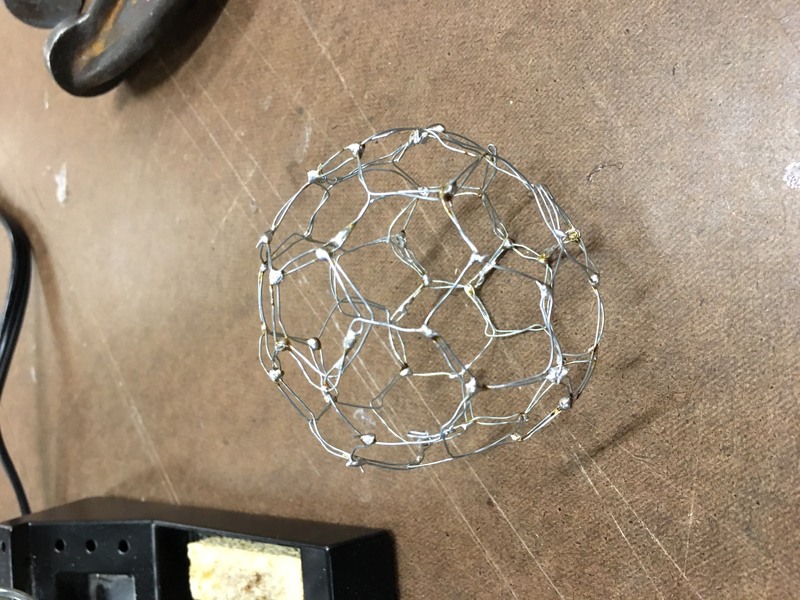 Being an amateur maths enthusiast my obsession with geometric structures and buckminster fuller continues so I wanted to iterate in my geodesic dome from last week but simplified to be a truncated icosahedron or a buckyball. The structures can be found on wolfram alpha. Originally I intended to make them out of wood and I prototyped making one out of cardboard. At this point I felt pretty good about it. But I remembered that I would have to make five so I spent a long time thinking about how I could pull it off. 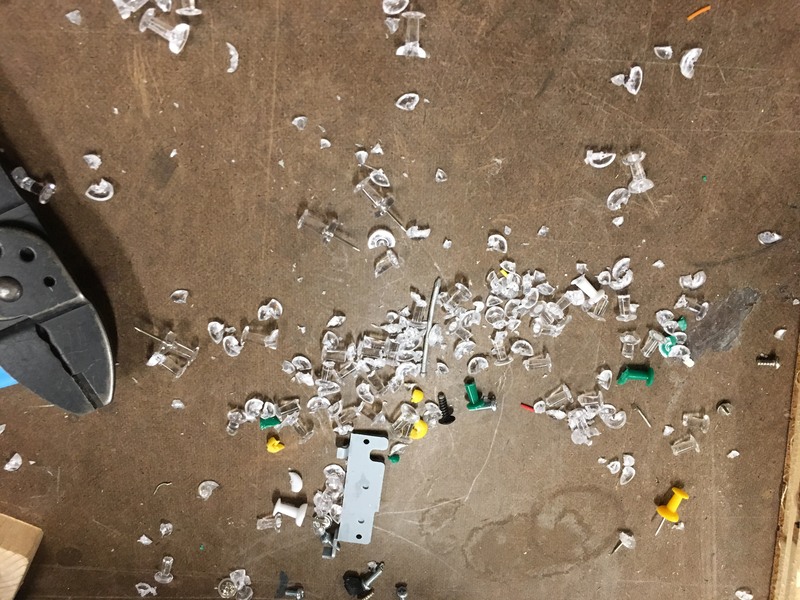 Last week I had a lot of problems when it came to assembling/ gluing. So I decided that my best bet would be to create armatures. I found a decent piece of scrap wood to make a wire bending jig. 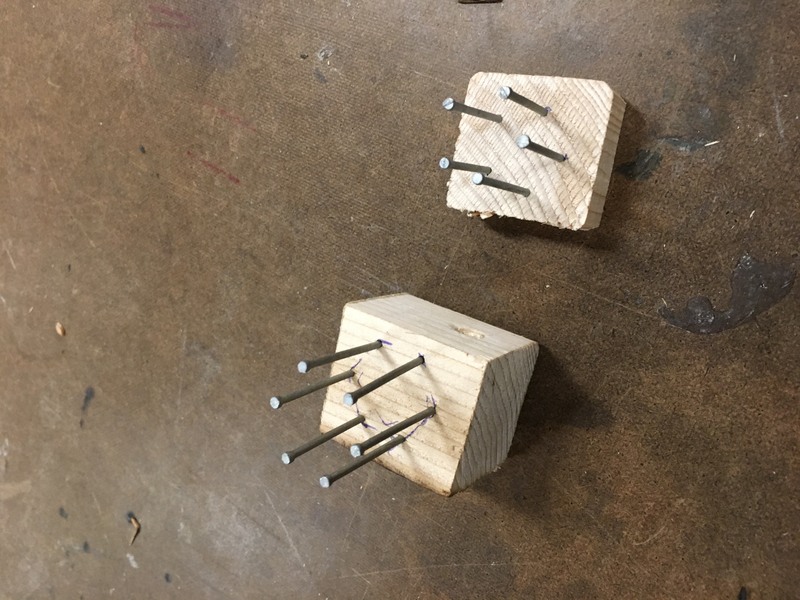 I tried using interior nails in the shop but found that they were to thick and gave too much of a radius. 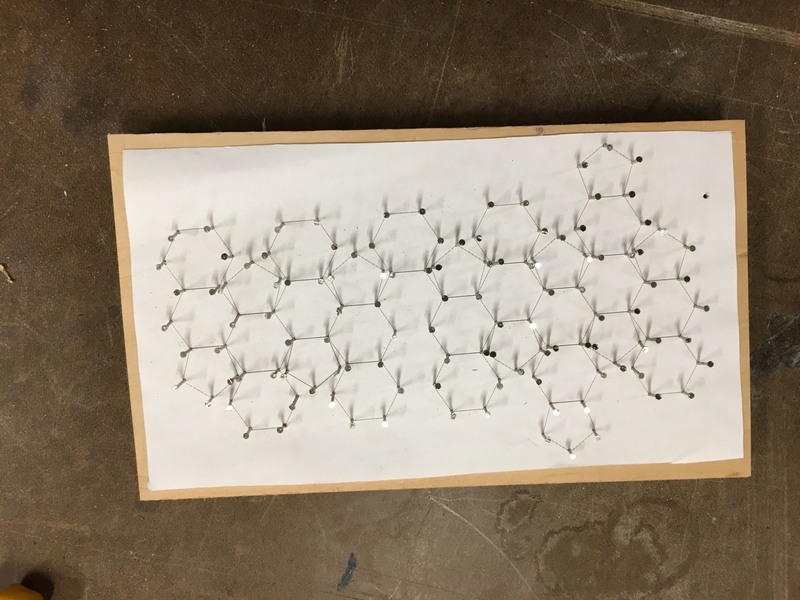 It was running late and the hardware stores were closed so I ran out to Walgreens and got a box of pushpins and laboriously trimmed the caps and nailed them in. This took an evening. At this point I was wondering if it was still a good idea as many passerbys asked what i had going on and either said that looked like an insane amount of work or not feasible but not one to let bad ideas stop me, I pushed on. I had earlier got a roll of 20 gauge wire thinking because I wanted something that could hold its structure. But on a small scale the wire would not bend easily so I moved onto 28 gauge wire. 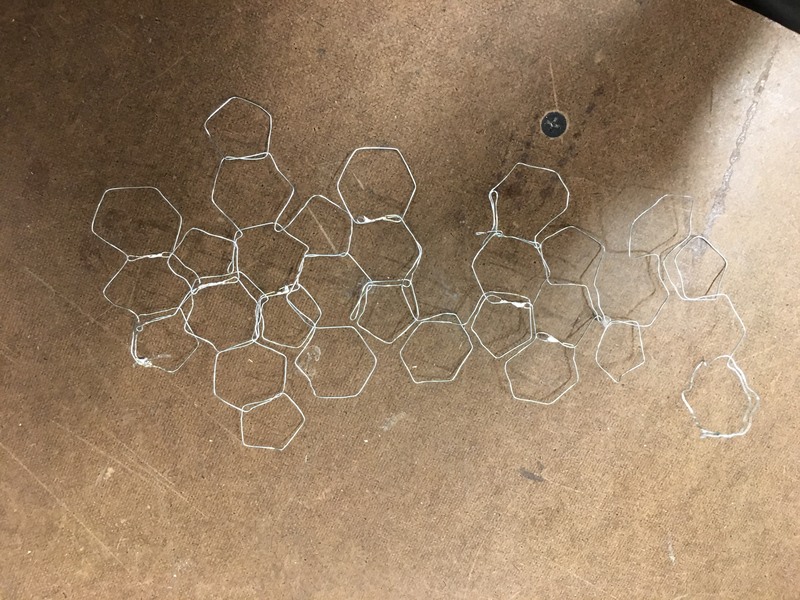 My process was to wrap my wire around the jig to make my templates. I then soldered the connections. 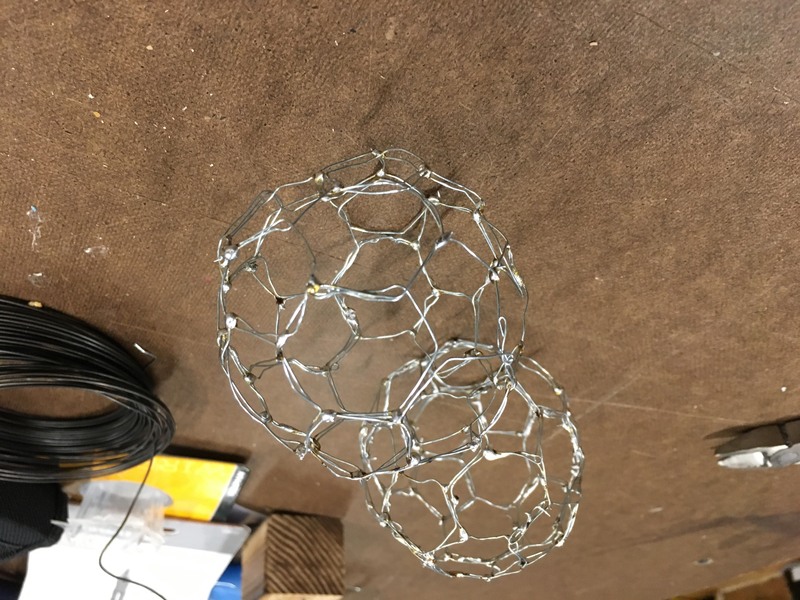 After that I assembled the icosahedrons and soldered the joints. 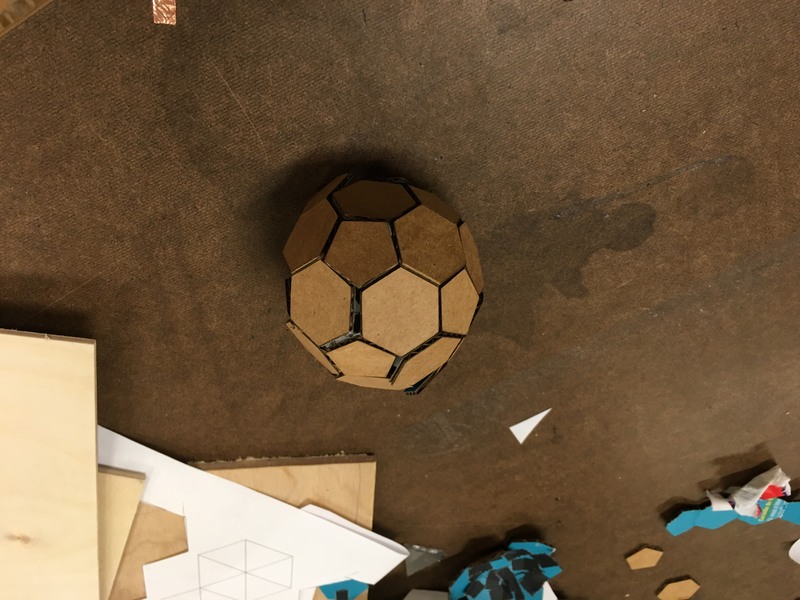 The first sphere took 2 hours but came out pretty good. The second one took longer, three hours, and this time it didn’t come out very well, but I felt like the process worked. Over the course of a few days I assembled more and more. With more practice bending the wire and soldering I was able to cut my time to 1 hour a form from bending to assembling. 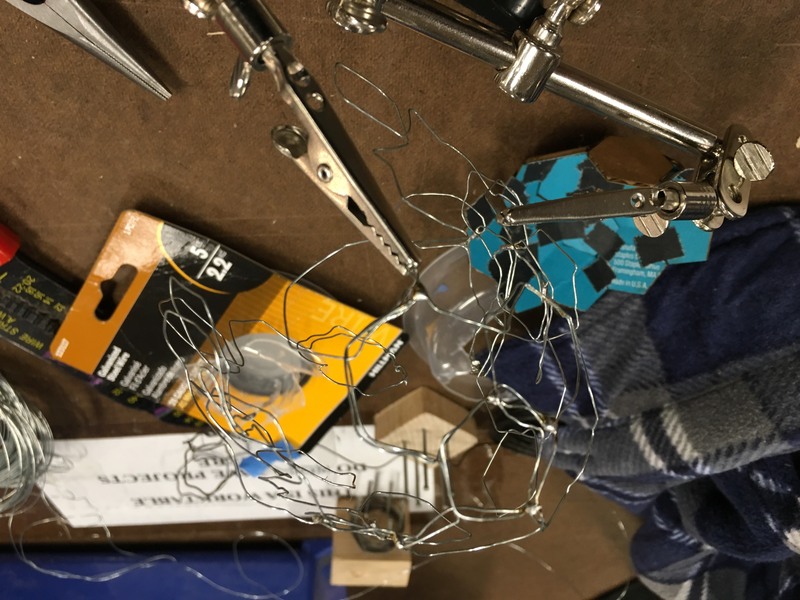 So while I didn’t come out with 5 wooden icosahedrons I now have 5 wire armatures. The structures themselves are surprisingly strong due to the geometry but the wires are still malleable. 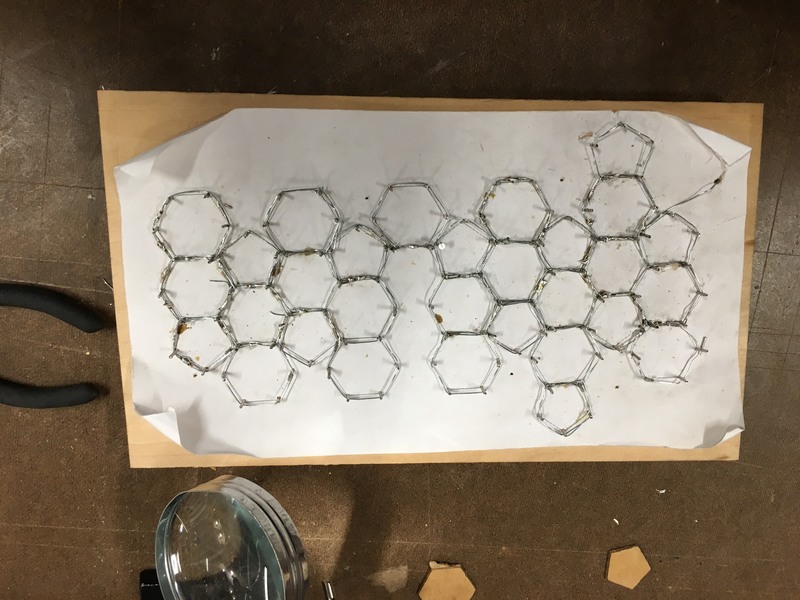 I have high hopes using the laser cutter to cut the panels out and fitting them into the armatures.